View 2019 Wild West Shootout results below. Earlier in the race, Bloomquist had taken command when Bobby Pierce surrendered the point with rear end failure. While Weiss topped the Late Model finale, Ricky Thornton, Jr., bested the Modifieds and Cole Searing added his fourth win of the six-race miniseries in X Modified competition with Darrell Nelson topping the makeup Modified main event from the previous night. Brandon Sheppard earned the Wild West Shootout championship in the Modified ranks with Nelson capturing Modified title honors and Searing scoring X Modified championship honors for the second year in a row. 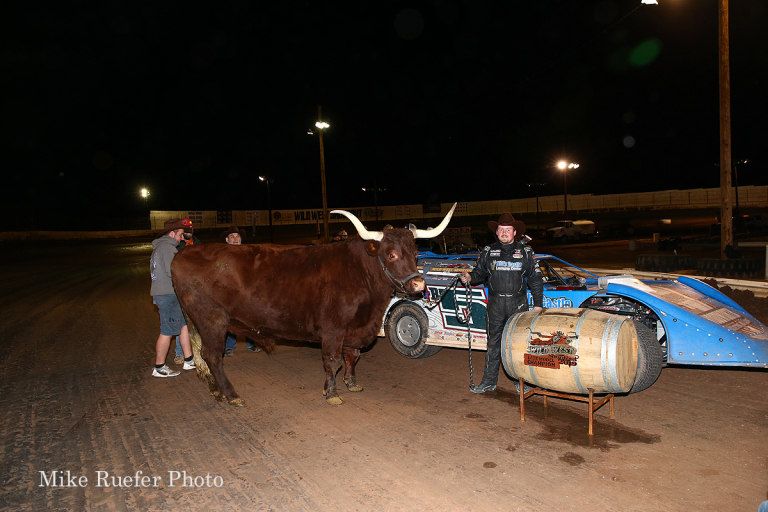 In the 50-lap Black Diamond Super Late Models presented by M&W Transport feature event, Bobby Pierce once again battled into the lead on the opening round and was gunning to bump Keyser Quarter Million Challenge bonus from $10,000 to $25,000 with a fourth win of the week. And for much of the race, it appeared that the Illinois racer would do just that. But for the second night in a row, Pierce slowed near the midway point to bring out a caution. This time, it came after 27 laps with race-ending rear end woes that handed the lead off to Bloomquist. 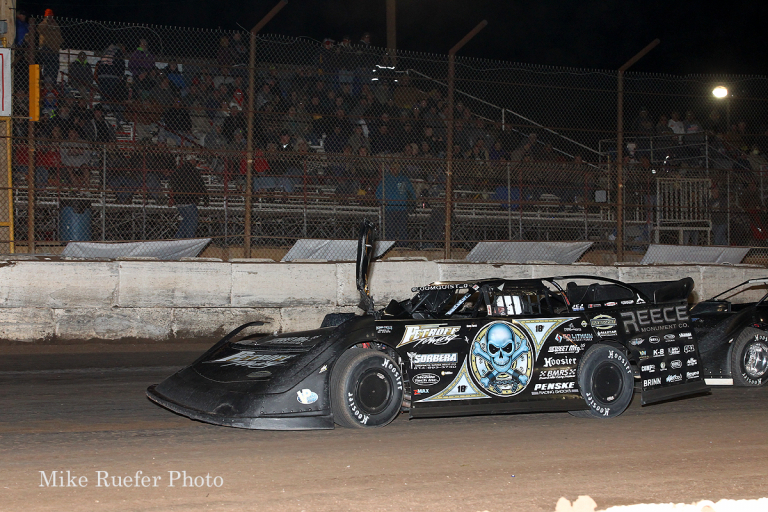 Closing in on his first career Wild West Shootout win, Bloomquist held nearly a half straightaway lead as he took the white flag only to have disaster strike when he tagged the car of R.C. Whitwell that was backed into the turn three wall. Weiss, who had worked his way towards the front from 11th, found himself out front on the restart and raced on to his second victory of the week. Brandon Overton chased Weiss to the line in second with Brandon Sheppard, Chase Junghans and Jimmy Mars rounding out the top five. 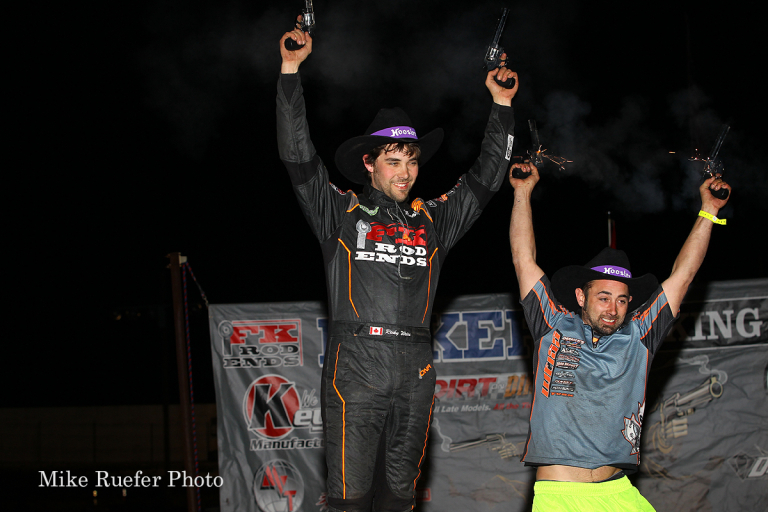 Sheppard’s sixth top-five run in as many events including one runner-up finish, two third-place showing, one fourth-place finish and a fifth-place outing was enough to net the 13th Annual Wild West Shootout championship. 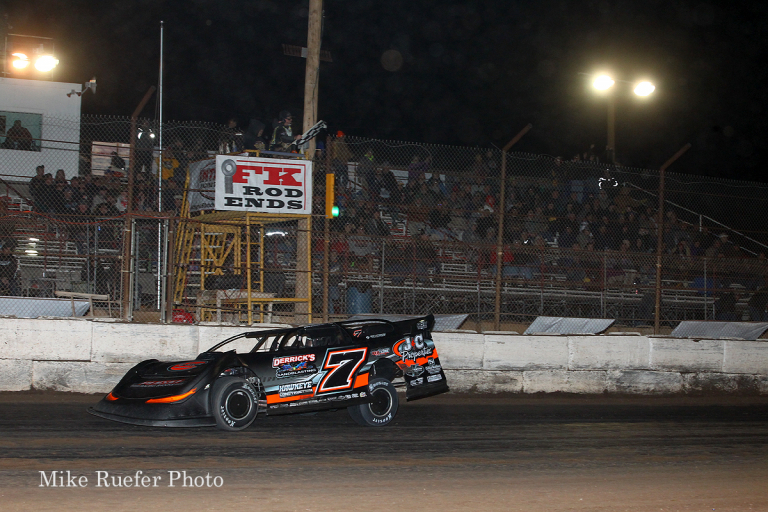 Darrell Nelson opened the night by fending off Rodney Sanders to win the 25-lap Mesilla Valley Transportation/Border International Modifieds presented by Arizona Differential feature event postponed from Saturday night while Ricky Thornton, Jr., became the first repeat winner of the week by leading Sanders and Dereck Ramirez to the stripe in the finale. Five top-fives in six events including the makeup feature win gave Nelson the Wild West Shootout Modified championship by just nine points over Sanders. South Dakota’s Cole Searing put an exclamation point on a second consecutive Wild West Shootout championship effort in the RHRSwag.com X-Mods presented by Barnett Harley-Davidson ranks by racing to his fourth win of the week ahead of Austin Hunter and Preston Carr in the 20-lap finale. After winning three of six features last year, Searing upped it to four along with a runner-up and a third-place finish to take the title by a comfortable 76 point advantage. Group 1: 1. 97-Cade Dillard 15.589, 2. 2-Brandon Overton 15.617, 3. 32b-Cody Laney 15.683, 4. 71-Hudson O’Neal 15.771, 5. 91p-Jason Papich 15.882, 6. 38-Joey Tanner 15.943, 7. 10n-Rob Sanders 16.335, 8. 83-Dennis Souza 16.805, 9. 7w-Richard Wallace 16.859, 10. 42s-Don Shaw NT. Group 2: 1. 0-Scott Bloomquist 15.154, 2. 32p-Bobby Pierce 15.336, 3. 86-Kyle Beard 15.442, 4. 1p-Earl Pearson, Jr. 15.491, 5. 91-Tony Toste 15.497, 6. 51-Joey Moriarty 15.523, 7. 15d-Justin Duty 15.745, 8. 44-Cole Schill 16.012, 9. 78s-Steve Stultz 16.241, 10. 37-Rob Mayea 16.760. Group 3: 1. 18-Chase Junghans 15.426, 2. 11-Pat Doar 15.452, 3. 7-Ricky Weiss 15.498, 4. B5-Brandon Sheppard 15.499, 5. 2s-Stormy Scott 15.641, 6. 75-Terry Phillips 15.955, 7. 28c-John Cornell 16.005, 8. 76-Blair Northdurft 16.111, 9. 23-Brad Williams 16.319, 10. 24-Xavier Ortega 16.925. Group 4: 1. 28m-Jimmy Mars 15.175, 2. 32-Chris Simpson 15.481, 3. 17-Billy Franklin 15.522, 4. 71rc-R.C. Whitwell 15.578, 5. 1g-Garrett Alberson 15.630, 6. 20v-Rece Vaught 15.763, 7. 15v-Kolby Vandenbergh 15.895, 8. 6T-Terry Carter 16.575, 9. 942-Steve Isenberg 16.678. Heat One (8 Laps): 1. 2-Brandon Overton, 2. 97-Cade Dillard, 3. 32b-Cody Laney, 4. 71-Hudson O’Neal, 5. 91p-Jason Papich, 6. 42s-Don Shaw, 7. 38-Joey Tanner, 8. 10n-Rob Sanders, 9. 7w-Richard Wallace, 10. 83-Dennis Souza. Heat Two (8 Laps): 1. 32p-Bobby Pierce, 2. 0-Scott Bloomquist, 3. 1p-Earl Pearson, Jr., 4. 86-Kyle Beard, 5. 51-Joey Moriarty, 6. 91-Tony Toste, 7. 44-Cole Schill, 8. 37-Rob Mayea, 9. 78s-Steve Stultz, 10. 15d-Justin Duty (DNS). Heat Three (8 Laps): 1. 18-Chase Junghans, 2. 11-Pat Doar, 3. 7-Ricky Weiss, 4. B5-Brandon Sheppard, 5. 2s-Stormy Scott, 6. 75-Terry Phillips, 7. 76-Blair Northdurft, 8. 28c-John Cornell, 9. 23-Brad Williams, 10. 24-Xavier Ortega. Heat Four (8 Laps): 1. 28m-Jimmy Mars, 2. 71rc-R.C. Whitwell, 3. 32-Chris Simpson, 4. 1g-Garrett Alberson, 5. 17-Billy Franklin, 6. 20v-Rece Vaught, 7. 942-Steve Isenberg, 8. 6T-Terry Carter, 9. 15v-Kolvy Vandenbergh (DNS). First “B” Main (12 Laps): 1. 2s-Stormy Scott, 2. 42s-Don Shaw, 3. 75-Terry Phillips, 4. 38-Joey Tanner, 5. 91p-Jason Papich, 6. 28c-John Cornell, 7. 76-Blair Northdurft, 8. 23-Brad Williams, 9. 24-Xavier Ortega, 10. 7w-Richard Wallace, 11. 83-Dennis Souza, 12. 10n-Rob Sanders. Second “B” Main (12 Laps): 1. 51-Joey Moriarty, 2. 91-Tony Toste, 3. 17-Billy Franklin, 4. 44-Cole Schill, 5. 20v-Rece Vaught, 6. 37-Rob Mayea, 7. 78s-Steve Stultz, 8. 6T-Terry Carter. Dash (10 Laps): 1. 91p-Jason Papich, 2. 76-Blair Northdurft, 3. 20v-Rece Vaught, 4. 24-Xavier Ortega, 5. 37-Rob Mayea, 6. 78s-Steve Stultz. “A” Main (50 Laps): 1. 7-Ricky Weiss, 2. 2-Brandon Overton, 3. B5-Brandon Sheppard, 4. 18-Chase Junghans, 5. 28m-Jimmy Mars, 6. 1p-Earl Pearson, Jr., 7. 71-Hudson O’Neal, 8. 1g-Garrett Alberson, 9. 97-Cade Dillard, 10. 86-Kyle Beard, 11. 91p-Jason Papich, 12. 42s-Don Shaw, 13. 0-Scott Bloomquist, 14. 11-Pat Doar, 15. 91-Tony Toste, 16. 71rc-R.C. Whitwell, 17. 38-Joey Tanner, 18. 44-Cole Schill, 19. 51-Joey Moriarty, 20. 17-Billy Franklin, 21. 32b-Cody Laney, 22. 32p-Bobby Pierce, 23. 32-Chris Simpson, 24. 75-Terry Phillips, 25. 2s-Stormy Scott. “A” Main (25 Laps): 1. 442-Darrell Nelson, 2. 20-Rodney Sanders, 3. 71s-Dustin Strand, 4. 30-Matt Leer, 5. 02-Cody Scholpp, 6. 18z-Zane Devilbiss, 7. 4R-Dereck Ramirez, 8. J17-Jacob Gallardo, 9. 4w-Tyler Wolff, 10. 51-Alex Guthmiller, 11. 111-Bumper Jones, 12. 86-Kyle Beard, 13. 65x-Carlos Ahumada, 14. 32-D.J. Shannon, 15. 9-Jimmy Ray, 16. 19sb-Lance Mari, 17. 6-Casey Skyberg, 18. G17-Fito Gallardo, 19. 21-Casey Arneson, 20. 5b-Chaz Baca, 21. 20rt-Ricky Thornton, Jr., 22. 75-Cody Skytland, 23. 17-Lance Schill, 24. 91-Joe Duvall (DNS). Heat One (8 Laps): 1. 71s-Dustin Strand, 2. 20rt-Ricky Thornton, Jr., 3. 111-Bumper Jones, 4. 19sb-Lance Mari, 5. 33-Steve Muilenberg, 6. 86-Kyle Beard, 7. 6d-Dylan Goplen, 8. 44-Christy Barnett, 9. 7-Ken McCleskey, 10. 5c-Steve Carter. Heat Two (8 Laps): 1. 4w-Tyler Wolff, 2. 1tpo-Tyler Peterson, 3. 9-Jimmy Ray, 4. 02-Cody Scholpp, 5. 75-Cody Skytland, 6. 51-Alex Guthmiller, 7. 77x-Austin Kuehl, 8. 131-Royal Jones, 9. 5b-Chaz Baca, 10. 6-Casey Skyberg, 11. 2-Don Gumke. Heat Three (8 Laps): 1. 18z-Zane Devilbiss, 2. 17-Lance Schill, 3. 4R-Dereck Ramirez, 4. 32-D.J. Shannon, 5. 8a-Al Giesbrecht, 6. 3-Tim Tharp, 7. 21z-Isaiah Geisel, 8. 36-Ryan Cousins, 9. D25-David Tanner, 10. 196-Joey Olschowka. Heat Four (8 Laps): 1. 442-Darrell Nelson, 2. 20-Rodney Sanders, 3. 65x-Carlos Ahumada, 4. 30-Matt Leer, 5. J17-Jacob Gallardo, 6. 2a-Casey Arneson, 7. 10c-Chad Olsen, 8. 57-Duke Erickson, 9. 27-Scott Greer. “B” Main One (12 Laps): 1. 65x-Carlos Ahumada, 2. 86-Kyle Beard, 3. 6d-Dylan Goplen, 4. J17-Jacob Gallardo, 5. 44-Christy Barnett, 6. 33-Steve Muilenberg, 7. 10c-Chad Olsen, 8. 57-Duke Erickson, 9. 3-Tim Tharp, 10. 5c-Steve Carter. “B” Main Two (12 Laps): 1. 30-Matt Leer, 2. 77x-Austin Kuehl, 3. 2a-Casey Arneson, 4. 21z-Isaiah Geisel, 5. 36-Ryan Cousins, 6. 2-Don Gumke, 7. 27-Chris Unrau, 8. 6-Casey Skyberg, 9. 7-Ken McCleskey, 10. 8-Scott Greer, 11. 131-Royal Jones. “A” Main (25 Laps): 1. 20rt-Ricky Thornton, Jr., 2. 20-Rodney Sanders, 3. 4R-Dereck Ramirez, 4. 71s-Dustin Strand, 5. 442-Darrell Nelson, 6. 18z-Zane Devilbiss, 7. 4w-Tyler Wolff, 8. 1tpo-Tyler Peterson, 9. 19sb-Lance Mari, 10. 2a-Casey Arneson, 11. 30-Matt Leer, 12. 86-Kyle Beard, 13. 51-Alex Guthmiller, 14. J17-Jacob Gallardo, 15. 02-Cody Scholpp, 16. 32-D.J. Shannon, 17. 77x-Austin Kuehl, 18. 9-Jimmy Ray, 19. 21z-Isaiah Geisel, 20. 65x-Carlos Ahumada, 21. 6d-Dylan Goplen, 22. 17-Lance Schill, 23. 75-Cody Skytland, 24. 111-Bumper Jones. Heat One (8 Laps): 1. 5c-Preston Carr, 2. 39-Steve Muilenberg, 3. 27c-Dave Cain, 4. 19-Lucas Rodin, 5. 1s-Scott Bintz, 6. 8n-Nick Rivera, 7. 44JT-Jaime Torres, 8. 88-Nathan Smith, 9. 15s-Wade Skindelein, 10. 17x-Rob Moseley, 11. 7b-Bailey Cousins, 12. 97x-Don Schaefer. Heat Two (8 Laps): 1. 37x-Skeeter Estey, 2. 44-Austin Hunter, 3. 17-Lance Schill, 4. 97-Coleman Anderson, 5. 777-Mike Rosales, 6. 10c-Cole Haugland, 7. 13b-Jsss Brekke, 8. 3J-Josh Cain, 9.171-Jed Smith, 10. 07-Donovan Flores, 11. 1-Shelby Frye, 12. 81x-Matt Spardy. Heat Three (8 Laps): 1. 16-Jason VandeCamp, 2. 16x-Skyler Smith, 3. 10-Cole Searing, 4. 27x-Kalvin Iverson, 5. 2g-Brock Gronwold, 6. 30-D.J. Tesch, 7. 32-Eric Haugland, 8. 316-Chase Alves, 9. 6c-Kalvin Caitlin, 10. US-Jonathan Olmscheid, 11. 20-Austin Ellis, 12. 19d-Dane Durbin. “B” Main (12 Laps): 1. 44JT-Jaime Torres, 2. 3J-Josh Cain, 3. 32-Eric Haugland, 4. 777-Mike Rosales, 5. 30-D.J. Tesch, 6. 88-Nathan Smith, 7. 15s-Wade Skindelien, 8. 17x-Rob Moseley, 9. 19d-Dane Durbin, 10. 316-Chase Alves, 11. 6c-Kalvin Caitlin, 12. 07-Donovan Flores, 13. US-Jonathan Olmscheid, 14. 171-Jed Smith, 15. 1x-Shelby Frye, 16. 13b-Jess Brekke, 17. 7b-Bailey Cousins, 18. 20-Austin Ellis, 19. 97x-Don Schaefer. “A” Main (20 Laps): 1. 10-Cole Searing, 2. 44-Austin Hunter, 3. 5c-Preston Carr, 4. 37x-Skeeter Estey, 5. 16-Jason VandeKamp, 6. 1s-Scott Bintz, 7. 97-Coleman Anderson, 8. 16x-Skyler Smith, 9. 8n-Nick Rivera, 10. 777-Mike Rosales, 11. 3J-Josh Cain, 12. 88-Nathan Smith, 13. 17-Lance Schill, 14. 10c-Cole Haugland, 15. 27x-Kalvin Iverson, 16. 2g-Brock Gronwold, 17. 15s-Wade Skindelein, 18. 27c-Dave Cain, 19. 19-Lucas Rodin, 20. 39-Steve Muilenberg, 21. 44JT-Jaime Torres, 22. 32-Eric Haugland, 23. 30-D.J. Tesch, 24. 17x-Rob Moseley. The 13th Annual Wild West Shootout is made possible by Keyser Manufacturing, O’Reilly Auto Parts, FK Rod Ends, Black Diamond, M&W Transport, Mesilla Valley Transportation, Border Tire, Sport Truck RV, PFC Brakes, Arizona Differential, RHR RacingSwag, Barnett Harley Davidson, Hoker Trucking, Total Seal Piston Rings, Shaw Trucking, San Tan Ford, Toste Construction, Swift Springs, Pro Power Engines, Five Star Graphix, Beaver Stripes, VP Racing Fuel, Penske Racing Shocks and Hoosier Tires.